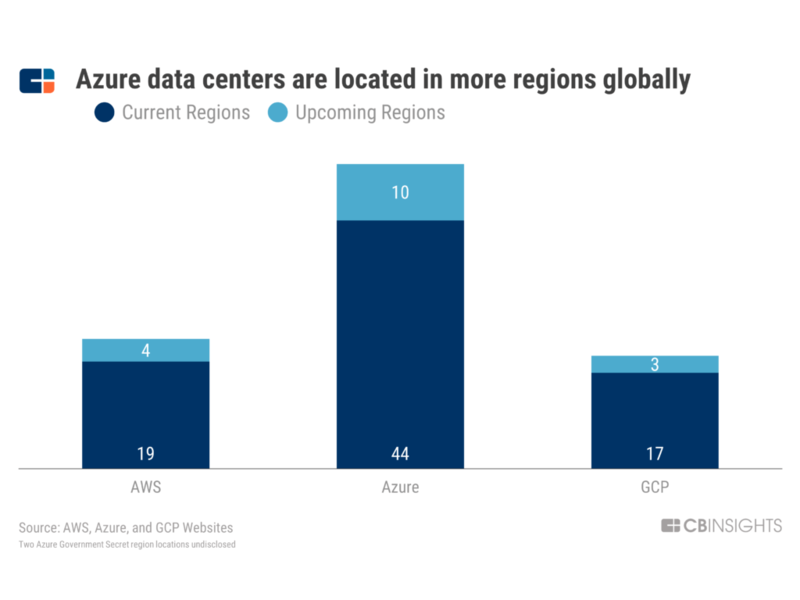 We analyzed the regional data center presence of AWS, Microsoft Azure, and Google Cloud Platform, and found that Azure is available in more regions globally. When Chief Information Officers (CIOs) assess public cloud providers, location is a primary consideration. Multinational organizations need to deliver content to their customers quickly and reliably — having a physical data center presence in their respective regions help. Find out why the industry is expected to reach $513B by 2022. Get the full 59-page report. Azure counts 44 regions: Azure is present in more than twice as many regions as either AWS or GCP. With 10 additional regions announced, Azure will soon operate in 54 regions globally. Azure announces 2 African regions: This will provide Azure with an uncontested opportunity to grow its market share throughout the continent. However, while neither AWS nor GCP has plans to launch data centers in Africa at this time, they are able to provide cloud services through their globally connected networks. Azure leads in hybrid-cloud computing: Hybrid-cloud has been a primary driver of growth for Azure and one of the company’s greatest competitive advantages. Hybrid-cloud computing is an infrastructure architecture that connects public cloud services to private, local area, or on-premise cloud services. Many of the world’s largest organizations use hybrid-cloud as a way to benefit from the scalability and flexibility of the public cloud while maintaining the security and control of on-prem infrastructure.